A whitelist is a list or register of entities (e.g. IP addresses or email addresses) that have been granted a particular privilege, service, access or recognition. For example, a whitelist of email addresses or domain names are given delivery rights over an email blocking program / spam filter. Is it Possible to Whitelist Trustpilot on My Server? No, IP whitelisting is technically not possible with ANY Trustpilot service. The reason for this is that we use a cloud based system, where IP addresses and ranges change dynamically all the time. What this means is that what might work today, won't necessarily work a day or even an hour from now. How Can I Use Whitelisting on Trustpilot? 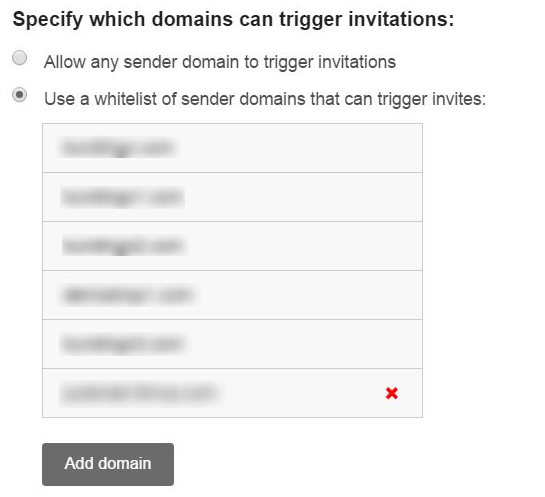 If you are using AFS to send invitations to your customers, you can create a whitelist of sender domains that specifies the domains that can trigger invites. This way Trustpilot knows what emails are allowed to trigger invitations to your customers. These can be configured in your Business Portal: go to Get Reviews > Automatic Feedback Service and under Configuration options, you can opt to create a whitelist of trigger domains.